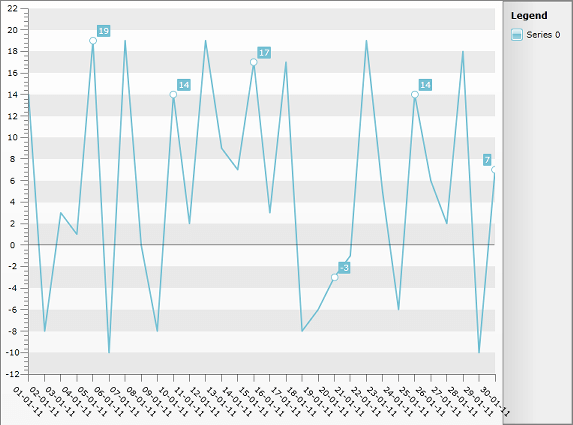 This help article will show you how to show PointMarks and Labels for specific points of Line Chart due to some condition - on every fifth day (assuming that on XAxis you have days of the month displayed). To learn more about showing DateTime values on XAxis please read the DateTime support section. PointMarkVisibility - will be applied to the PointMark Style (Visibility property). Note the UpdatePointMarkVisibility *method called in the constructor of the class which sets *PointMarkVisibility property to visible only if the Day is dividable by 5, which is our condition to show Point Marks.